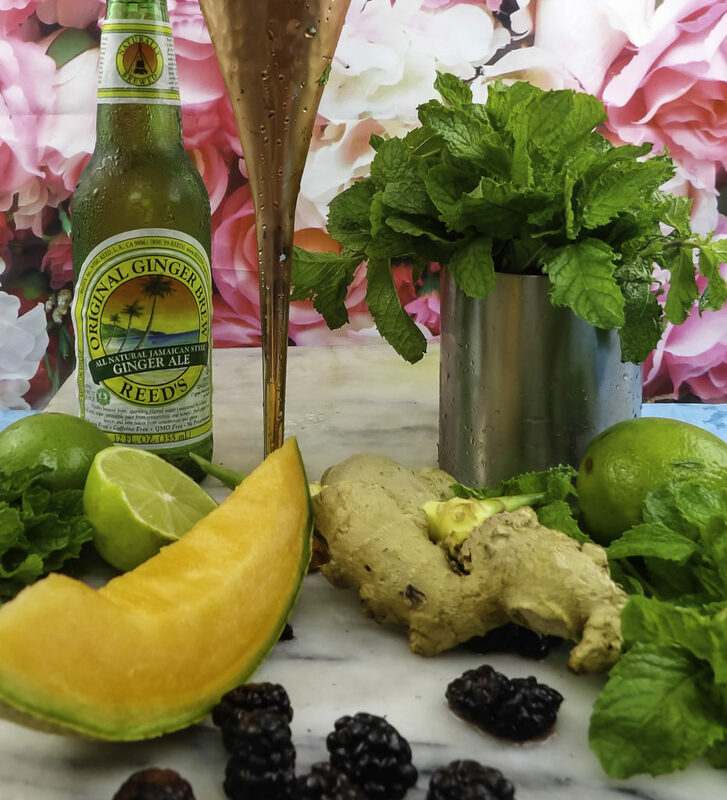 Looking for the perfect drink for an end of summer party or festive occasion? There are always the quintessential classics, but it’s fun to customize some drinks with a new, signature twist. 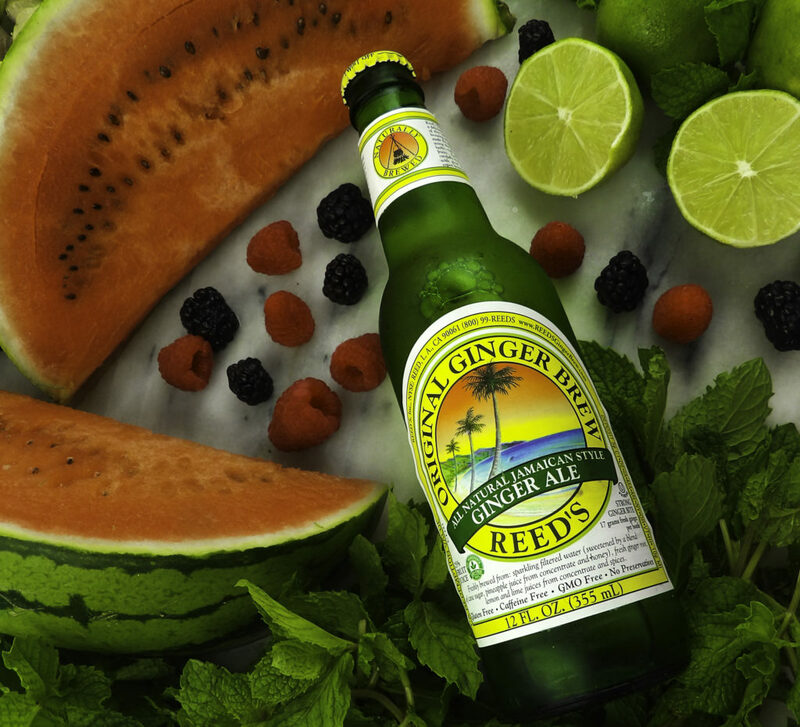 Summer is filled with such luscious fruits, the perfect opportunity to change up some of our favorites! One drink that’s especially adaptable is the Moscow Mule. You only need a few key elements for a successful Moscow Mule, and the rest of the ingredients allow for creativity and customization. Our current Moscow Mule obsession? Raspberry Watermelon Moscow Mules! See our recipe below. 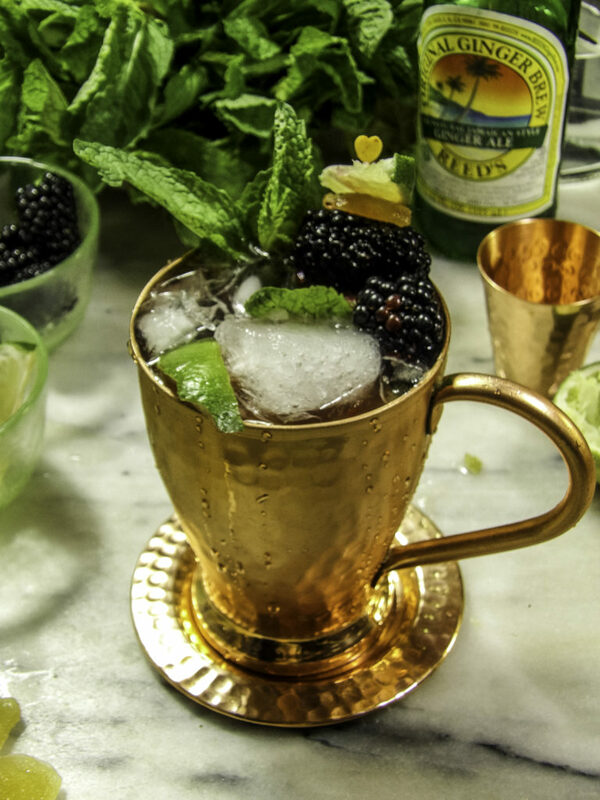 While you can serve a Moscow Mule in just about any kind of glass, copper is preferable. 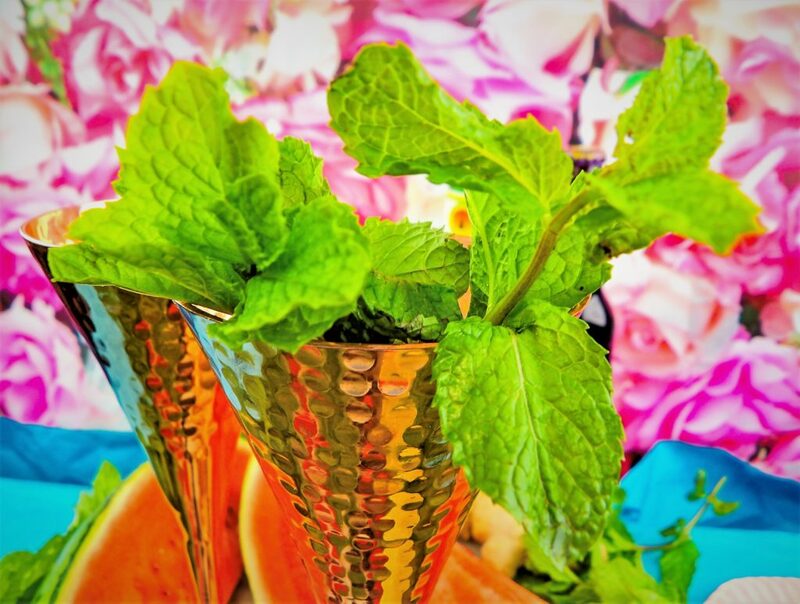 I prefer the Kamojo Moscow Mules because the pure copper has a tarnish resistant coating, so they stay beautiful and shiny without having to polish them, making them easy to clean. 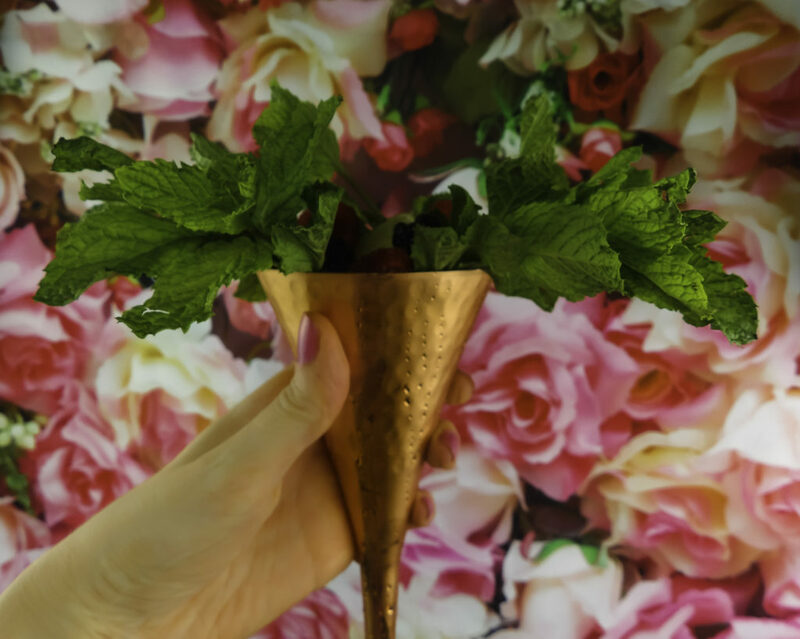 We previously touted what we love about the classic mug style Kamojo Moscow Mules in a beginning of summer Moscow Mule recipe, Kamojo also makes a copper champagne flute set for a festive, more formal, or celebratory event. 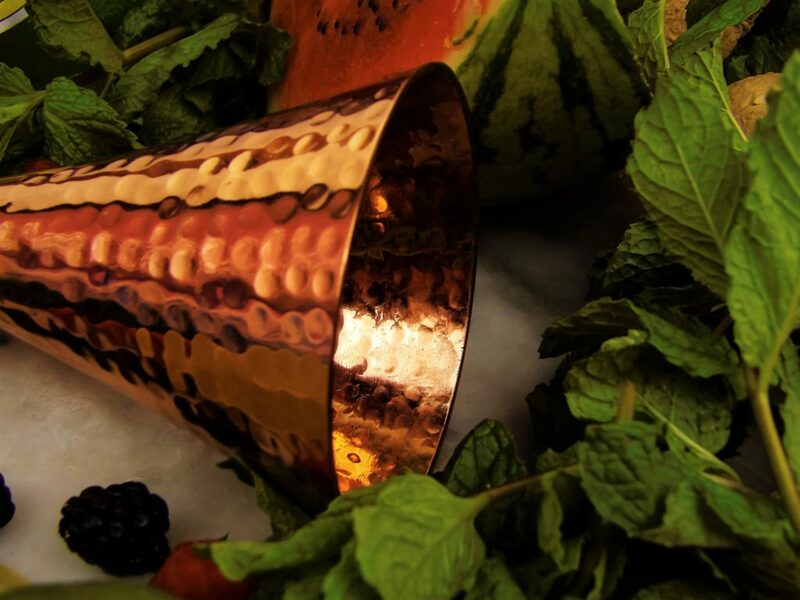 I also like the pretty hammered pure copper with its’ tarnish-resistant high-shine and the beautiful shape, it adds something to the overall visual appeal of the drink and looks so distinctive! 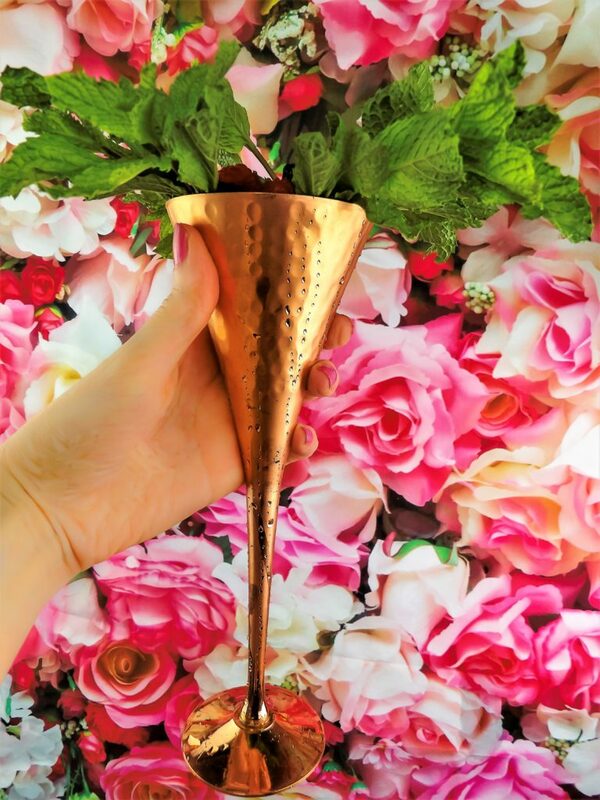 What’s a good type of drink to serve in a copper champagne flute? As a rule: if it’s bubbly or fizzy – copper kicks that carbonated or bubbly action it up a notch: any seltzer, soda, beer and of course, champagne or prosecco. Also, if it’s a drink best served cold, copper is your best bet. The reason for this is copper does two things: it quickly makes cold ingredients colder, and bubbly ingredients bubblier. That’s why a copper vessel is a key to a good Moscow Mule, especially for a summertime drink. 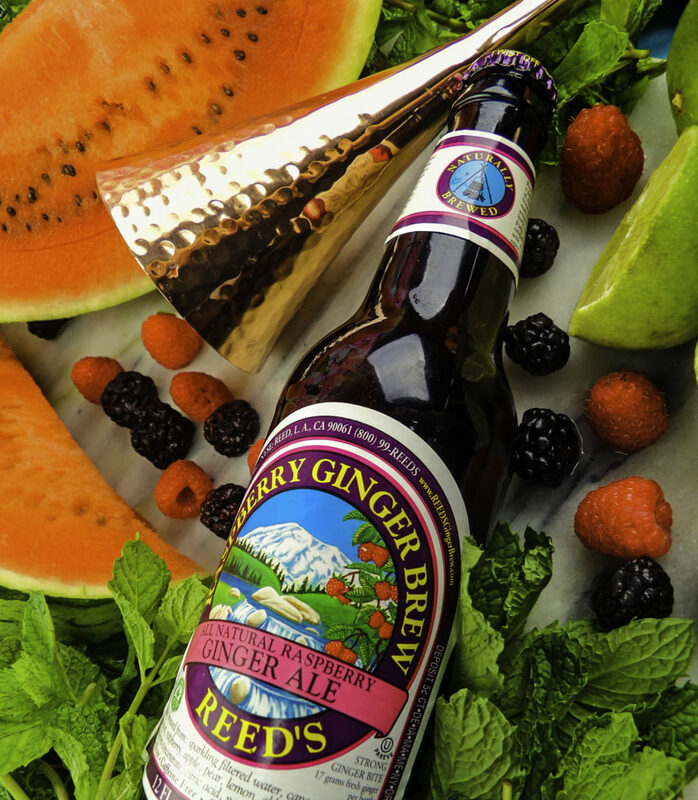 Copper also enhances the flavor of some ingredients, enhancing the crisp, citrus and sour notes of go-to ingredients like ginger, lime, and cucumbers. 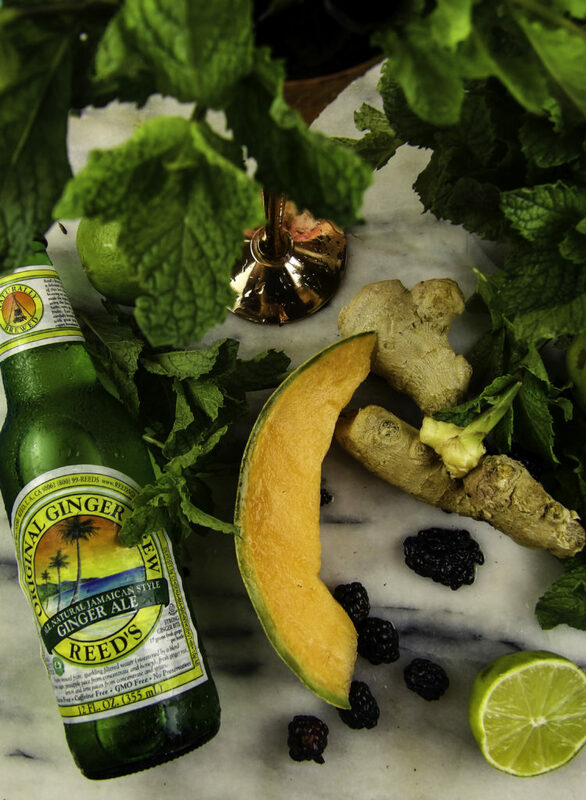 A key ingredient to a Moscow Mule is ginger beer. 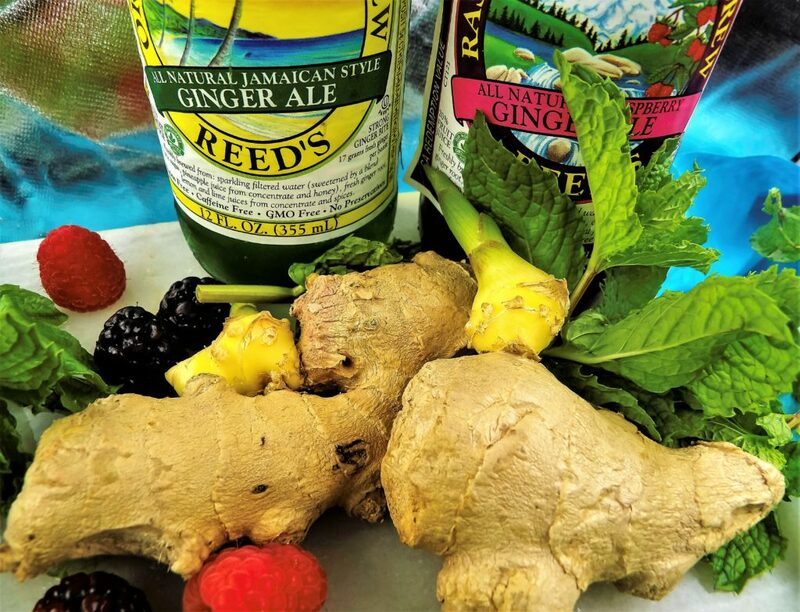 Ginger adds the kick to the mule and is generally obtained from ginger beer or in a pinch, a quality brewed ginger ale. The ginger ale is sweeter, the ginger beer is tarter and for some, might need the addition of simple syrup. I also like to add a thin slice of fresh ginger as part of a garnish or muddled at the bottom of the drinking vessel, or if you prefer your drinks a bit sweeter, a ginger simple syrup can be used. Lime and ginger are the core classics of the mule, and plenty of fruits taste great with both of them. Store bought and wild raspberries are abundant and delicious this time of year. 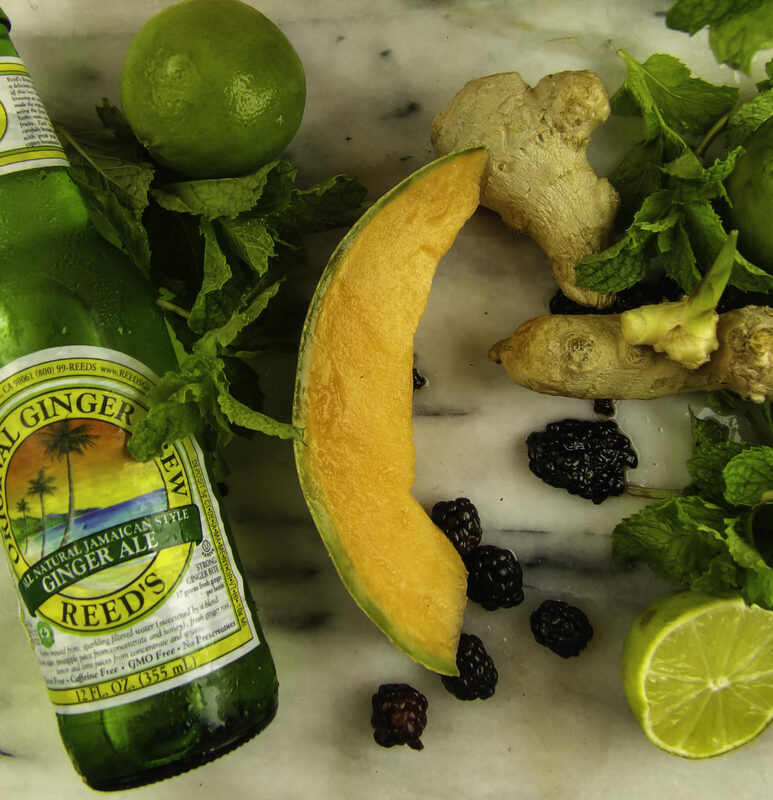 Reed’s brews both a gluten-free ginger beer and ginger ales with real cane sugar and they are pretty good in mules. Their raspberry ginger ale has all the kick and fizzy features of a ginger beer. 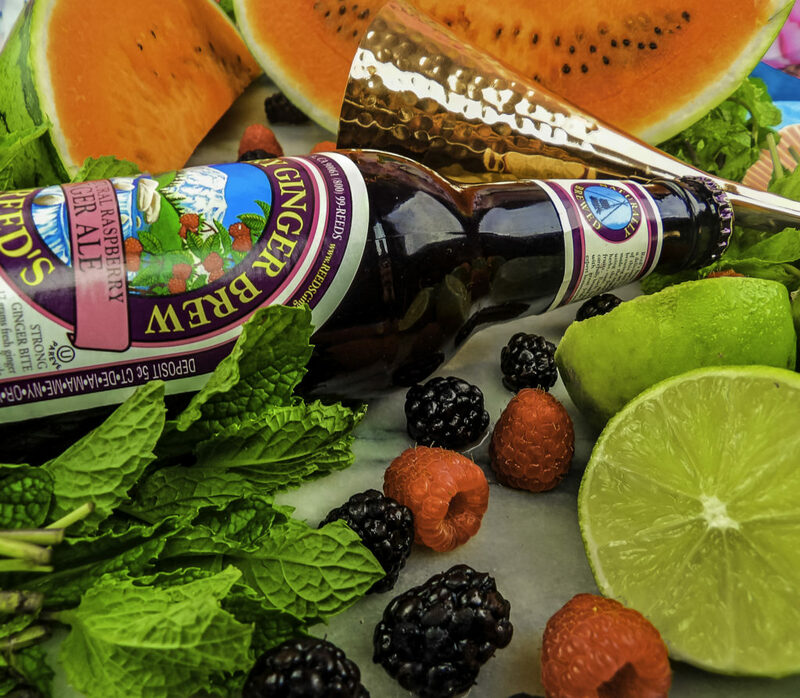 Raspberry Ginger Beer or Ale makes sense in a mule, as so many of the ingredients in a Moscow Mule taste great with raspberries: raspberry and lime, raspberry and mint, raspberry and ginger. But it still needs something to make it more summer, and a bit juicer and sweeter: like watermelon! 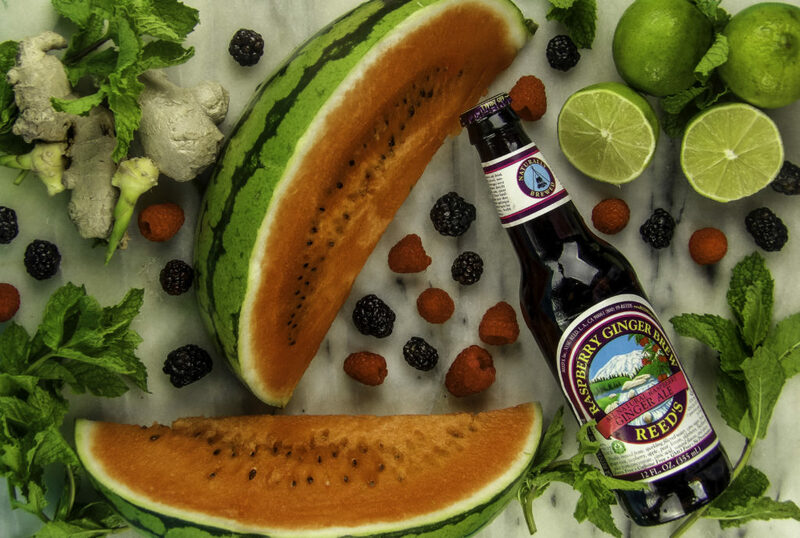 But lots of fruit combinations work: blackberries, lime, plum or pear and cantaloupe is a delicious alternative option, the cantaloupe and plum sweetly temper the ginger and the blackberries add a nice sweet but tart note. Or another option that goes surprisingly well with the ginger is lemon and fig! 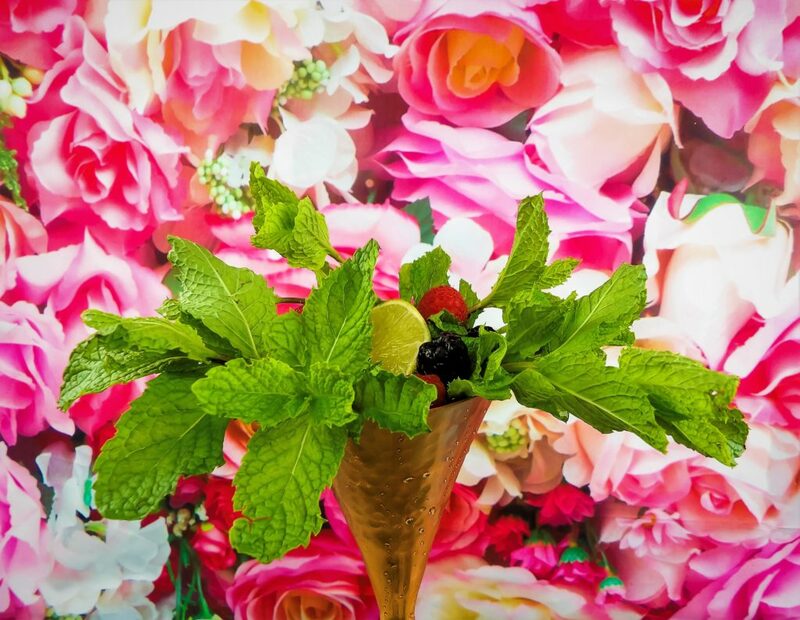 Just in time for your final farewell end-of summer soirees, summer picnics, a signature drink for summer weddings and celebrations, and for your end of summer blowouts. 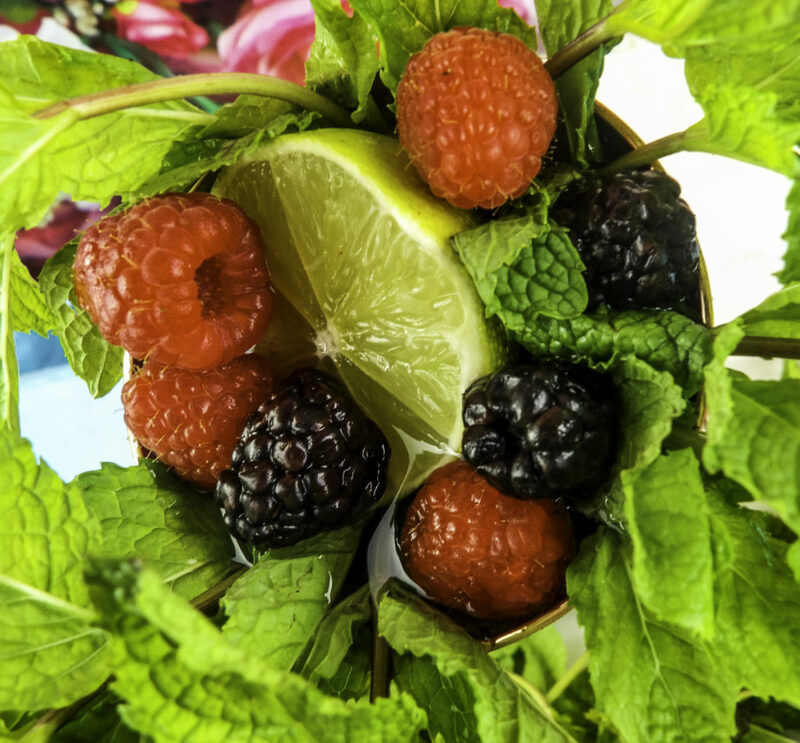 Ready to make a summer fruit Moscow Mule? Juice the limes. Set aside remaining lime slices for garnishing. Make watermelon juice. Put watermelon chunks in a blender, discard pulp if desired, pour the juice into a jar or glass, put aside. Muddle together a few raspberries, and lightly press a mint leaf and a thin slice of ginger (if desired). Pour the resulting mix into the copper mule. Add the lime juice over the muddled mix. Fill mule champagne with crushed or slushie ice, over the muddled mix. Halfway through adding ice, I like to toss in a few more berries and then another squeeze of the lime to fully infuse the drink. 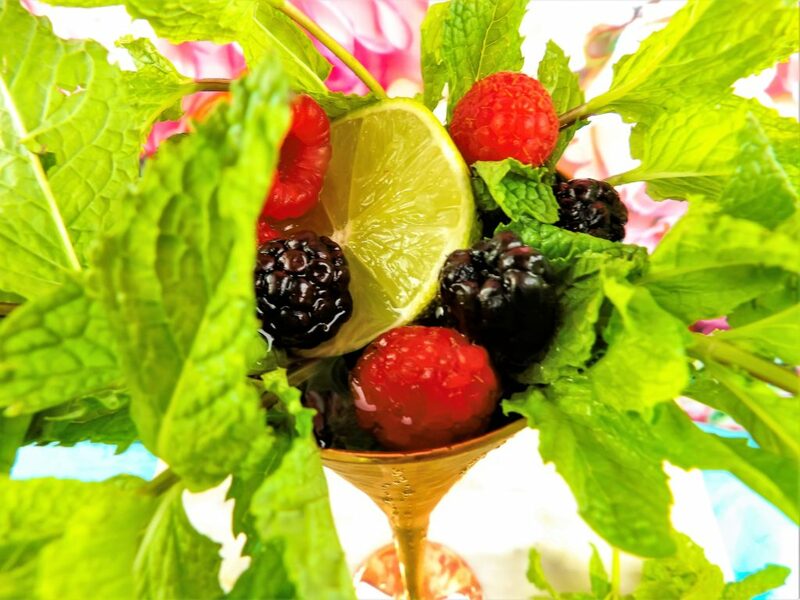 Garnish with plenty of fresh mint sprigs, berries, lime or even a small watermelon wedge if desired! 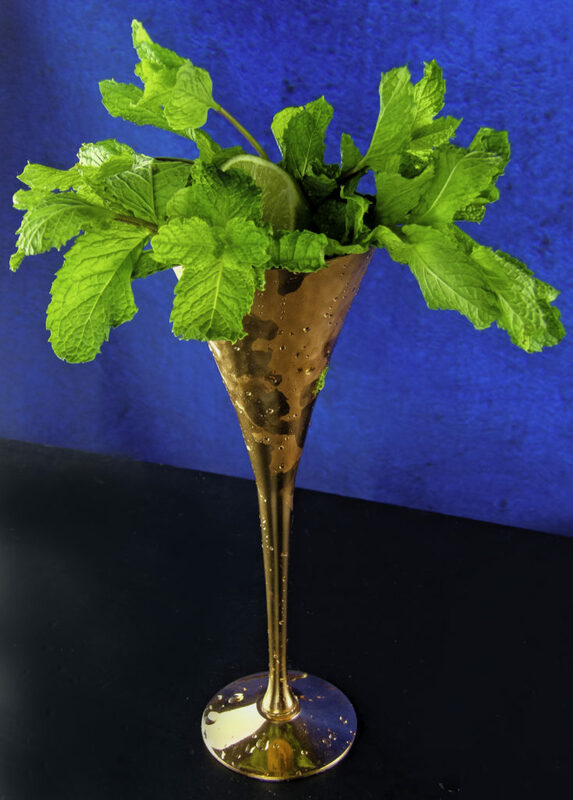 Garnish with plenty of mint sprigs! Some may prefer a “neater” approach to mix the lime juice, vodka, melon juice, and in a shaker with the spent limes and giving the mix a good shake, then pour that shaker mix through a strainer into the ice filled mule glass, and then add the ginger beer to the mule. 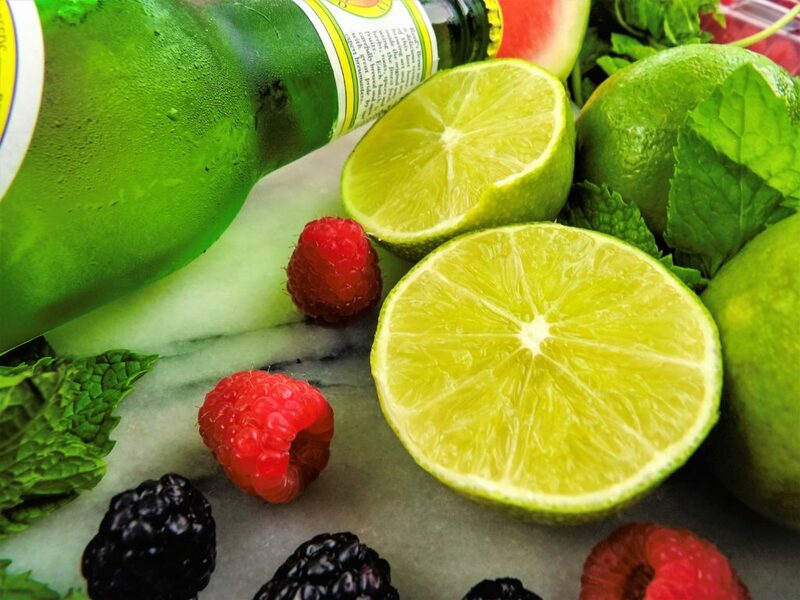 Adjust measurements to taste, some extra lime particularly enhances the berries and watermelon! Notice reference to soft ice above. Soft ice is not as hard as ice cubes, but harder than slushie ice. It is often served at Drive-In type restaurants, which remind me of the summers of my youth. 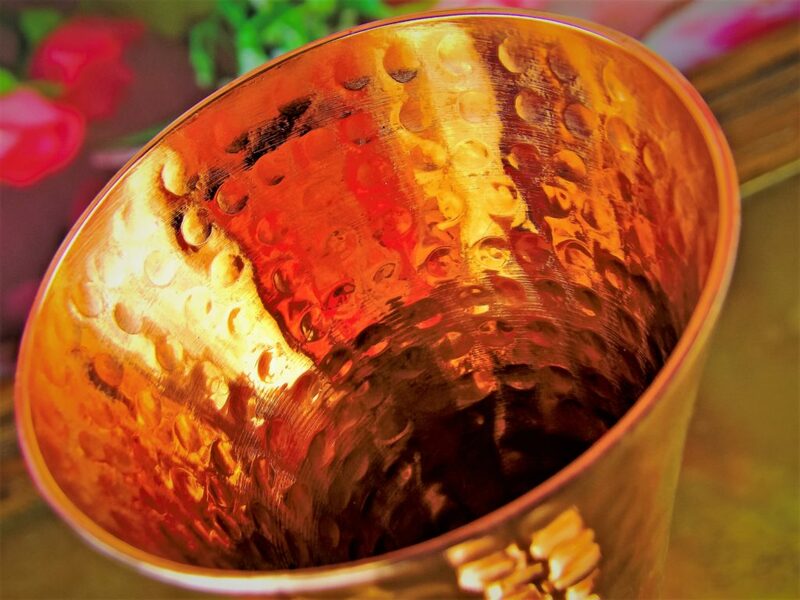 Due to the lovely flute shape of the Kamojo Moscow Mule Copper Flutes Set, you may prefer crushed or soft ice. It is easy to make yourself at home with a big bottle of carbonated water like seltzer water. Fill smaller to medium-size ice-cube trays with the seltzer, let them set a few hours. Right before using them, give them one or two hard whacks to break them up a bit. While soft ice tends to melt quickly in a regular drink, the copper mules keep them suspended in soft ice form for much longer without melting. So many events and milestones are worth celebrating, engagements, promotions, graduations, weddings, just to name a few. 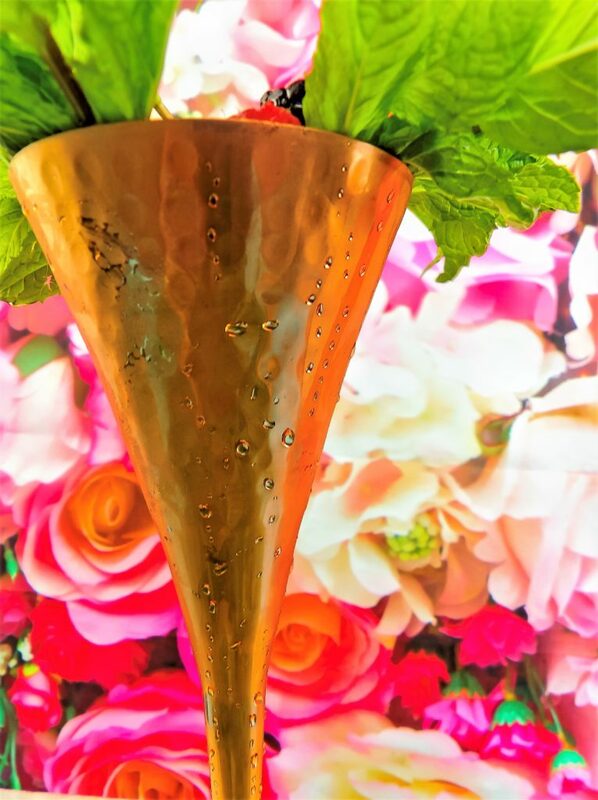 Champagne is often the go-to libation for celebrating, but it is fun to change it up a bit with a mule themed drink, and it still feels festive and celebratory when served in Kamojo Moscow Mule Copper Flutes Set. Kamajo Copper Champagne Flutes are ideal as wedding flutes for the bride and groom or even the entire bridal party, or to serve appetizers such as shrimp cocktail. 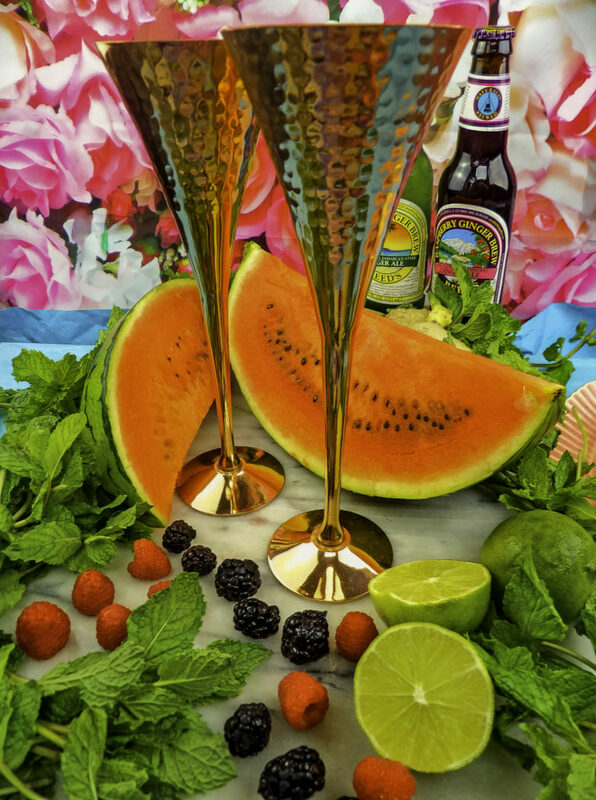 Summer fruit-filled Kamojo Copper Moscow Mules Champagne Flutes: Icy cold, satisfying, festive, and definitively summer! Style Chicks received the Kamojo Moscow Mule Copper Flutes Set in exchange for our unbiased review. 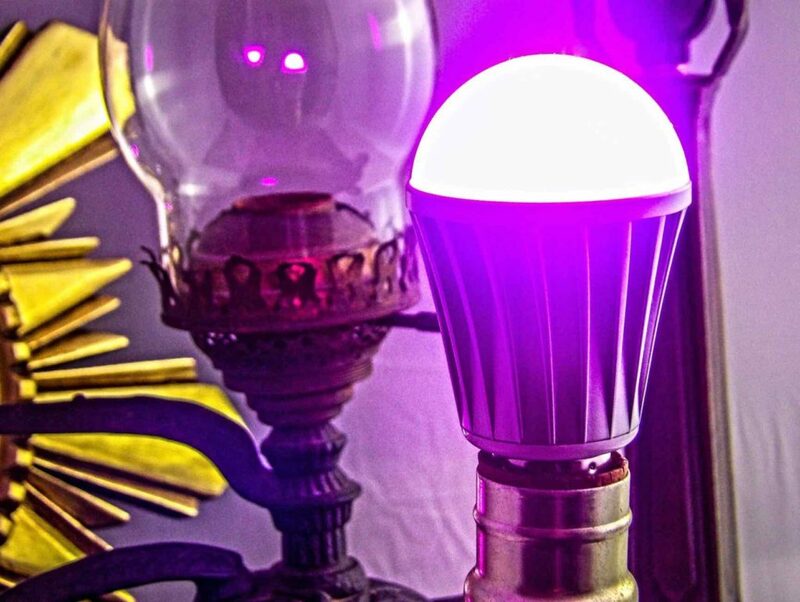 However, our experience with the product and the opinions expressed in this review are 100% ours. It is the season for weddings, which also means it is the season for anniversaries and lots of them. 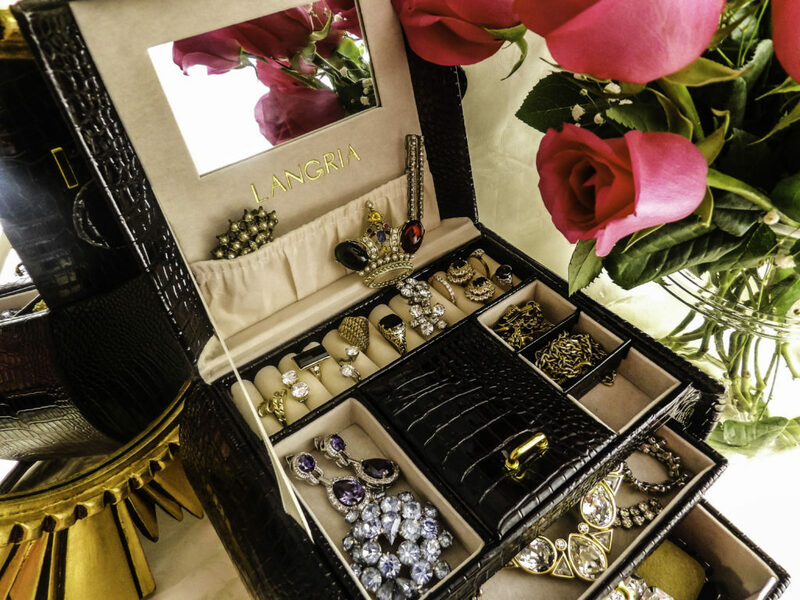 I like having a few presents on hand for unexpected gift giving occasions, parties or anniversary gifting obligations that I forget about until the last minute. This Matashi Ornament makes for a great gift because it is a modern twist on a classic design idea. 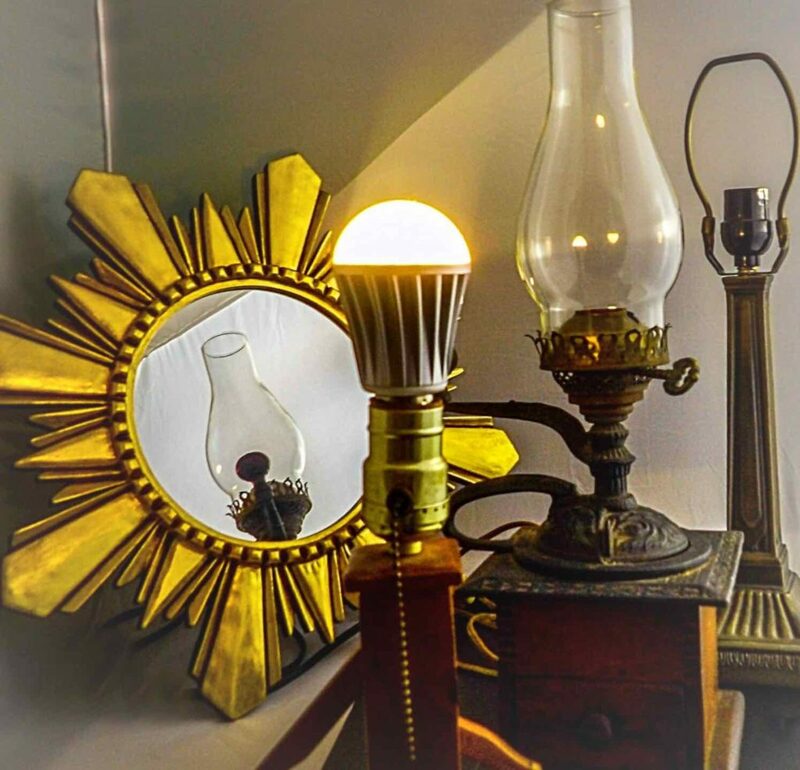 I like this type of gift item because it can match the decor of a modern or traditional style decor. 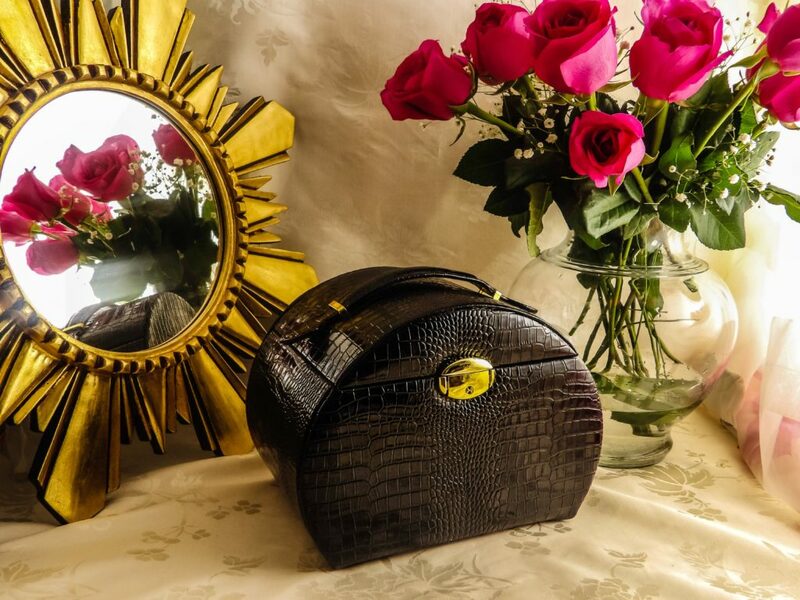 At times, I have gift obligations at work for a co-worker, boss or client, and know nothing about their taste, so a good traditional piece with a modern appeal is always a safe choice when gift-giving in a working relationship. 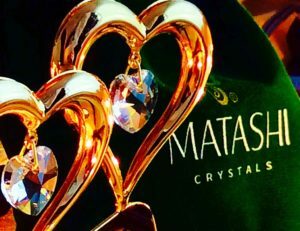 Matashi is a crystal design house with a Japanese origin. It started in 1995. 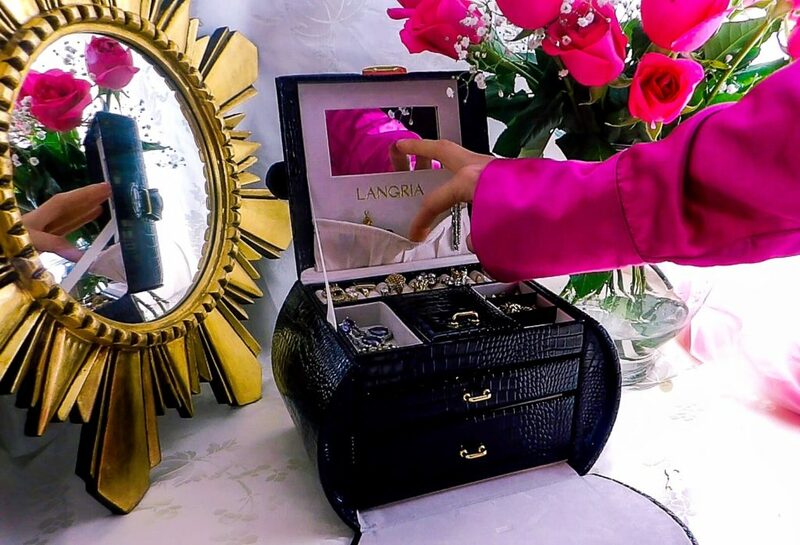 An artistic design studio with craftspersons who use fine materials with an Oriental design flair to form their collections of music boxes, jewelry boxes, nightlights, desktop novelties, wind chimes, and ornaments. 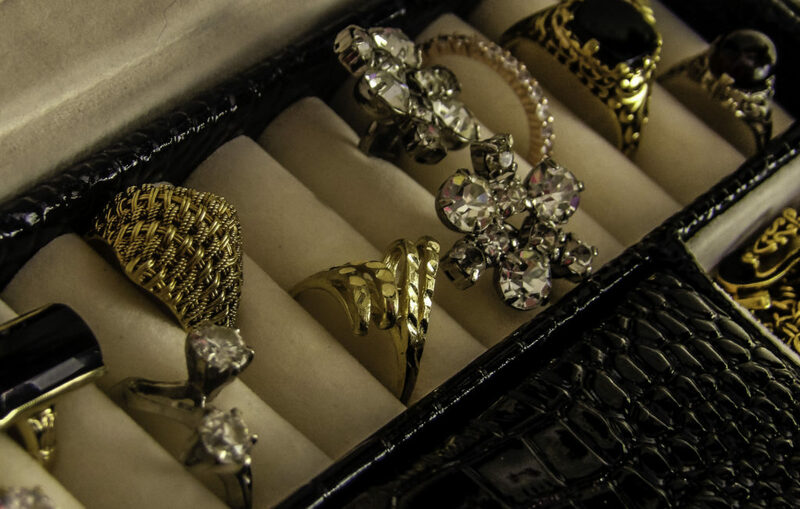 All Matashi collections exhibit premium Matashi crystals. 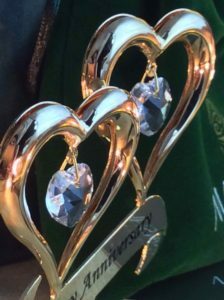 Each item, including this anniversary ornament, come with a serial number, authenticity certificate, and warranty. The ornament is well constructed. 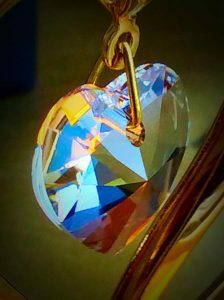 It is 24k gold plated and has two faceted precision cut crystal hearts that catch the light and give an eye-catching sparkle. The crystals are well secured. The ornament comes with a tasteful drawstring bag and gift tissue inside of a gift box. 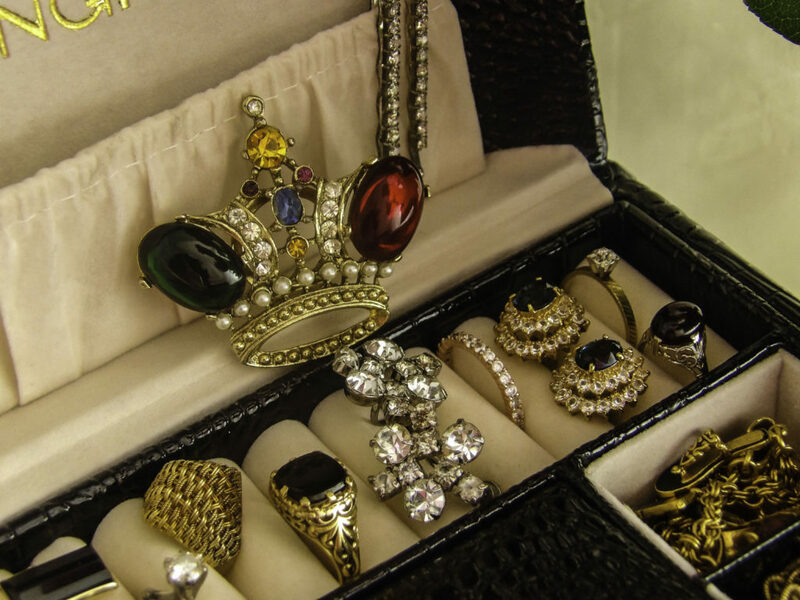 The gift box looks expensive and reminds me of the higher quality gift boxes that come with some crystal gift items from museums like the MET. 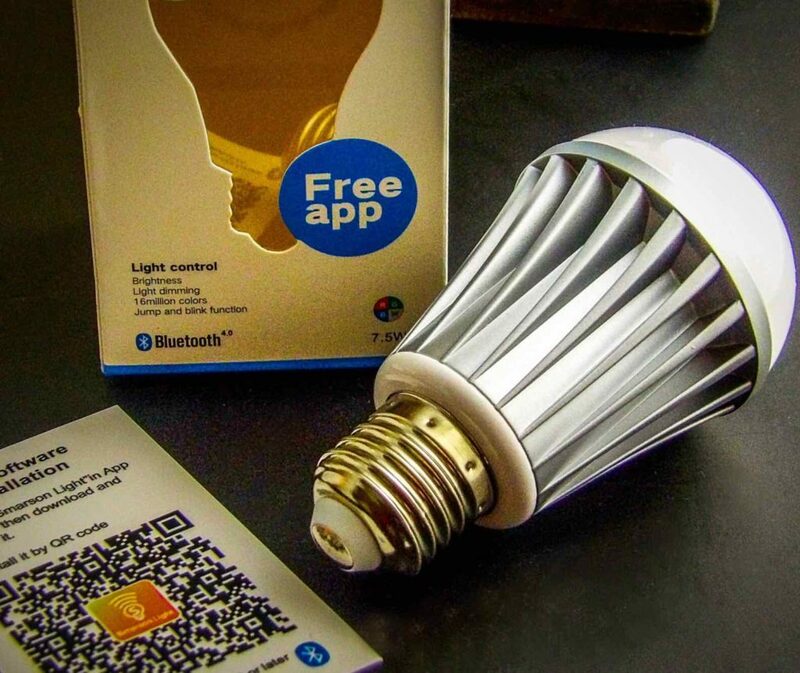 It comes with a gift card that you can sign so everything is nicely packaged and ready to give to the recipient. 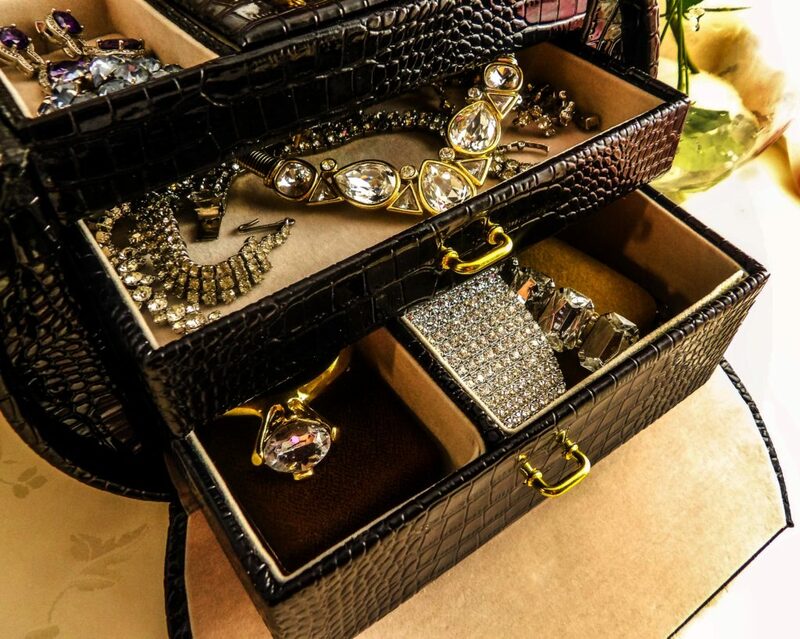 The packaging is sturdy enough for storage purposes so it can be displayed each year. While it is not the intended use in the strictest sense, the ornament is sized just right to be used as a cake topper for an anniversary cake or placed on the dessert table at an anniversary party. 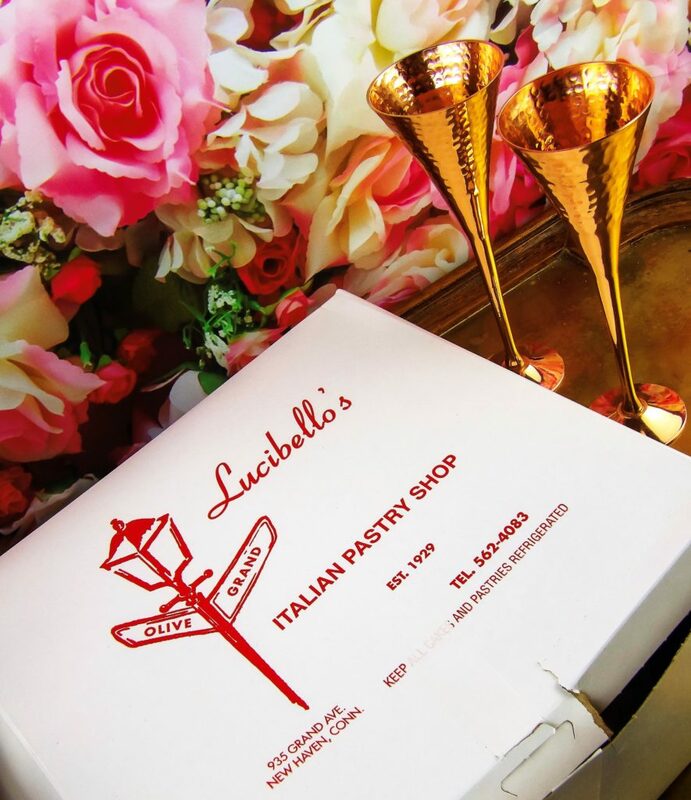 If you are someone who entertains frequently, and you are often the one to host the anniversary parties, this makes for a classic design element on cakes, cupcake towers, at the table, or by the bar during your celebration. 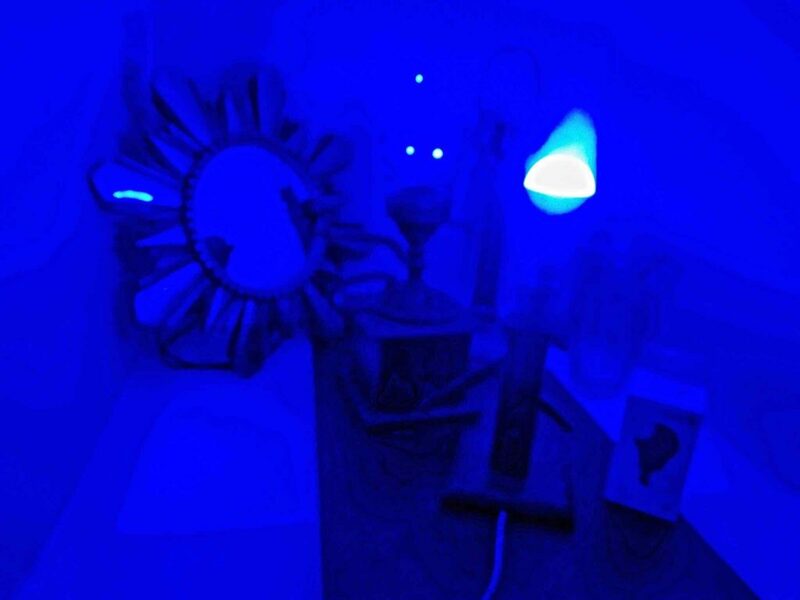 A display piece that fits into various design decors, this also makes a piece that is suitable for an office setting to convey discretely that the owner of the ornament is in a relationship. 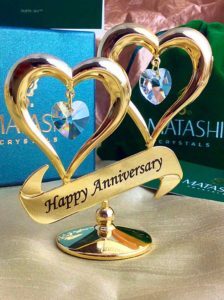 Since it does not denote a numerical year, this ornament is suitable for any anniversary, not just the “golden” anniversary. 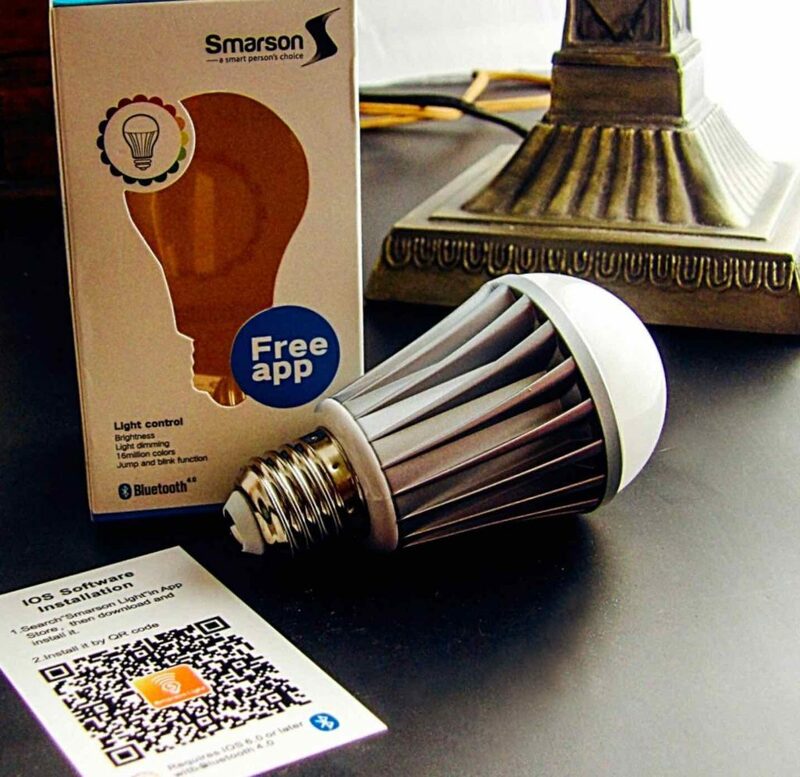 Find this great gift at Amazon.com.